“Corsica is not France,” read the road graffiti when the Tour visited the ‘Île de Beauté’ in 2013, for the first time in 100 editions. Whoever wrote it was right: Corsica, with its Italian and French history and rebellious, independent spirit, feels far removed from the mainland – and is all the better for it. With 650 miles of unspoiled palm-fringed coastline, a spine of wild, rugged mountains soaring to 10,000 ft., and an almost unlimited choice of challenging, winding roads – not to mention a robust and delicious local cuisine – it’s an utterly seductive destination for cyclists. Designated today as one of the 13 regions of France, but ruled for large swaths of its early history by Italy, Corsica is approximately two-thirds the size of Connecticut. It’s the ultimate study in dichotomies, not just temperamentally but in terms of landscape: coruscated mountains, parched desert, verdant lowlands, soft, sandy beaches, pine-thicketed valleys. Riders will explore the island in true RAID fashion, enjoying a carefully planned route set to showcase in the span of a week the best the island has to offer, in addition to the expert care and support RAID is known for. 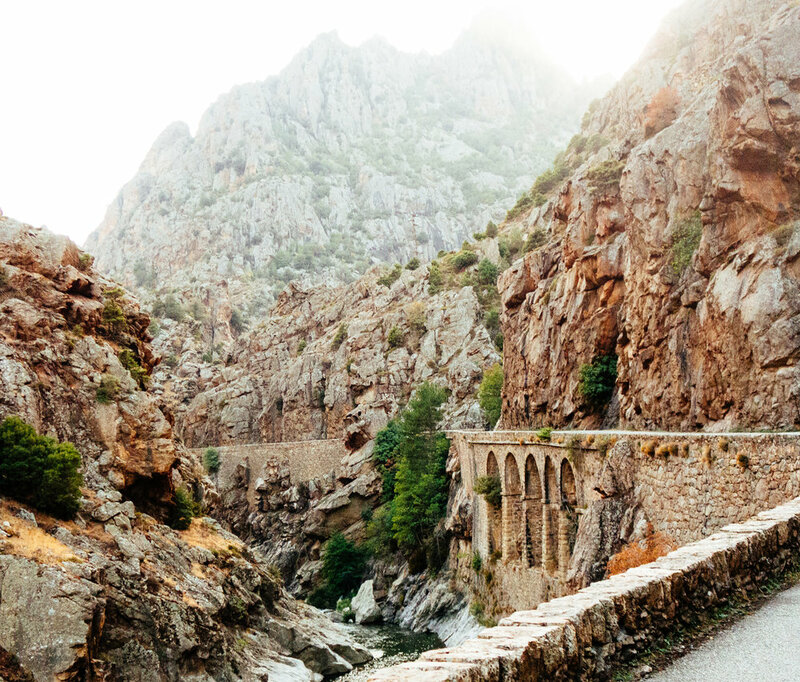 Ride the Corsican roads that, thanks to the ideal conditions, have become a standard training ground for professionals, with sublime cliffs and wild forests known to inspire riders to perform at their highest level. We should expect the same on the climbs of our ride, and all will be rewarded as we savor the finest cuisine and lodging the region has to offer, as well as the most incredible views as we descend to the azure sea below. Upon your arrival into Porto Vecchio, the RAID shuttle will transfer you to our beach front hotel in Porto Vecchio, The Hotel Mariosa. This afternoon, our Corsican adventure begins with a prologue in the form of a quick, undulating spin from Porto Vecchio. A perfect opportunity to get to know your guides and your riding mates for the week before enjoying your first night on the island, in the city that hosted the Tour de France’s Grand Départ in 2013. After our short ride, we will gather this evening for a group orientation to go over the daily itinerary and plan for the week followed by an evening meal. 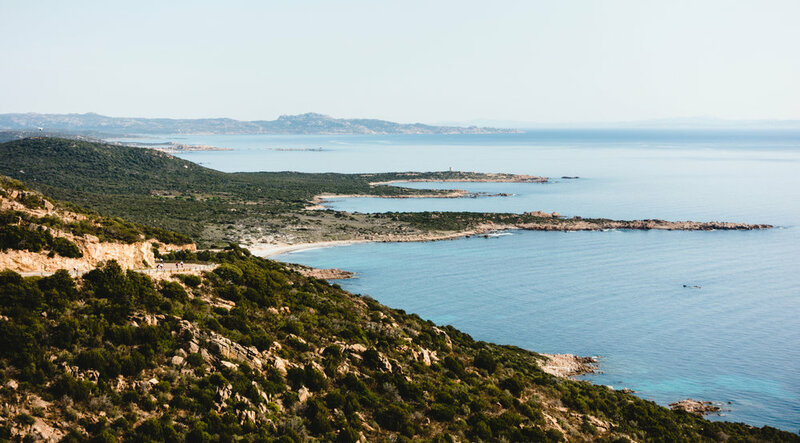 Porto Vecchio, on Corsica’s southeastern tip, is a characterful town surrounded by deserted white-sand beaches and is a great starting point for riding into the island’s wild southern interior. The spectacular route out of town takes us straight to the Col de Bacinu before descending on sweeping turns through dense, forested hills with unexpected vistas around every corner. The tunnels here were a favorite hideout of the Corsican Resistance against the Nazis. Sartène, our halfway point, is a pretty town dating mainly from the 16th century; to return, we take the spectacular red-rocked coast road, with beautiful views out over the Mediterranean. By the time you’ve ascended the second col, you’ll a dip in the sea and the fine dinner waiting for you at the hotel. On our second day in the saddle, we’ll traverse to the opposite side of the island via the rugged Parc Natural Régional de la Corse. We’ll begin by making our way to higher ground, and spend much of the day at altitudes approaching 1,000m. 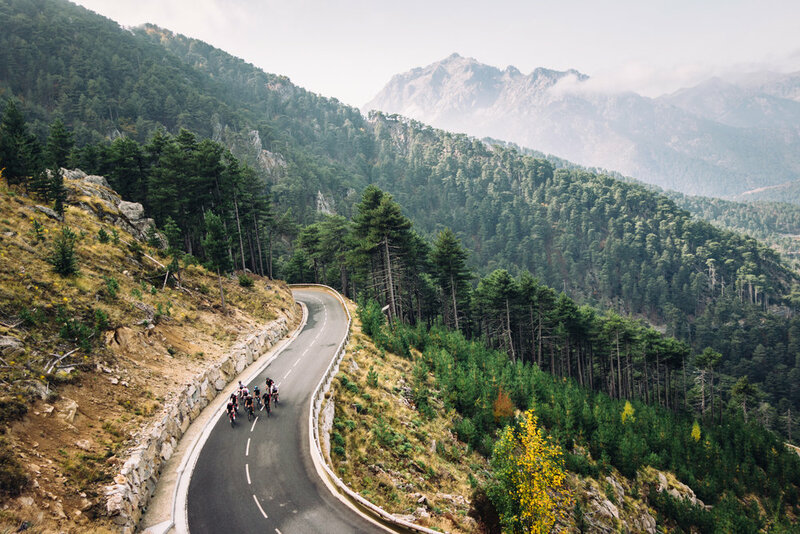 We’ll cycle through the cool pine forests that cloak the slopes of the many 2,000m-plus peaks that tower above us, and also pass through the maquis, the name given to the distinctive, fragrant scrubland that covers parts of the island. From there, we’ll begin the long descent to Punta di Porticcio. At our hotel, just steps from the beaches of a magnificent bay, we’ll enjoy a magical sunset and sleep to the sound of gentle waves against the shore. Today’s route takes us to the heart of the island, to Corte, a town at the center of the island’s fortunes since Pascal Paoli made it the capital of his short-lived Corsican Republic in 1755. A nationalist stronghold to this day, its position atop a craggy mount gives it the appearance of a fairytale citadel. On the way, we’ll take the famous corniche road that squeezes between rocky cliffs and the sea, and which provided such exhilarating viewing during the 2013 Tour. Then, after cycling round the Golfe de Sagone we’ll turn inland and climb more than 30km to the Col de Vergio – at 1,478m the highest paved road on the island. There are breathtaking views, including a glimpse of the famously tough GR20 hiking trail that runs along the spine of the island. The evening’s destination is the luxuriously tranquil Hôtel Dominique Colonna, a haven of design nestled in the lush Restonica river valley. For our fifth day, riders may choose to go for a short morning spin, and spend the afternoon exploring the village of Corte or taking in one of the remarkable local hikes. For the others, we will take the high road across the spine of the island, visiting charming perched hillside villages, deserted back roads, river gorges and the spectacular Col de Sorba. Tonight, we dine in town, at a small mother and son owned cafe that celebrates the local cheese, Corsican meats & local vegetables grilled over an open wood fire. Our journey culminates with one more substantial ride from the center of the island to the sea. The Bocca di Battaglia is the day’s highest point, and to finish there’s a fast descent and some stunning panoramas of the city of Calvi. It’s the perfect way to cap to a magnificent week on the wild and beautiful island of Corsica. The most notable of these climbs is the Bocca di Battaglia, the peak of the day’s ride. As we reach this popular hiking destination, a few grazing cattle will bear witness to our final efforts and we’ll savour one of the last vistas on our trip. The last 50 kilometers of our journey include a very fast descent and some stunning panoramas of the city of Calvi. It’s the perfect way to cap to a magnificent week on the wild and beautiful island of Corsica.